Source: Purchased at the Singing Wind Bookstore, Benson, Arizona. First Line: With low tongue and open mouth, the man began soft as a jazzman to pull off the seduction. Lilli Chischilly became a lawyer in order to protect her people-- the Navajo-- even to testifying before Congress about Colorado River water usage. 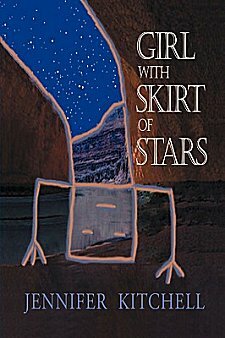 Happily married, she is disconcerted when her childhood friend, Jerome Bah, moves back to the reservation and makes contact with her, but she's thrown even further off balance when the president of the Navajo Nation insists she joins Senator Lee and his family on a rafting trip through the Grand Canyon. Thinking Lilli will be a captive audience, Lee intends to make sure she agrees to this legal guarantee. What neither of them know is that Lee has an enemy who's determined to kill him somewhere along the river down in the depths of the Grand Canyon. Furthermore, the enemy's chances of success are excellent since there are only eleven people traveling on the raft. Kitchell has a very lyrical writing style that has unexpected touches of humor, as when someone claims another character is "so narrow minded he could applaud with his ears." The raft trip through the Grand Canyon is extremely suspenseful, since the reader knows there's a killer waiting for them somewhere along the route. A secondary plot line that involves Lilli's childhood friend, Jerome Bah, adds tension between Lilli and Jerome as well as serving as a natural springboard for sharing many Navajo customs and stories. We could learn much from the Navajo. Tony Hillerman knew this, and Jennifer Kitchell, in her beautifully told story, is following in his footsteps. Life is brief, she thought, tenuous, but it has a point. We are here to create life, and to teach it, and to die old in beauty. "Beauty" did not mean you walked to old age with no illness, or you walked to old age with cosmetically enhanced qualities of the young. It was not about physical attributes. It was about a quality of character. May all of you walk in beauty. This one apparently has a great story, and Navajo customs. Could it be that I've found something to fill a little of that emptyness since Hillerman died? I see you bought it at your favorite bookstore too. I like the environmental angle on this one, and also that it deals with the Navajos. It sounds like a book I wouldn't mind sitting down with for a few hours, and your review was wonderful. Thanks for sharing it with us! Cathy - I'm a Hillerman fan, so this one interests me - a LOT! Thank you for sharing (although I'm not sure my TBR is exactly happy about it... ;-) ). Barbara-- I really enjoyed the way Kitchell was able to incorporate so many Navajo customs and stories into the story. Margot-- Of course your TBR is happy; they all love company!